Be the first to share your favorite memory, photo or story of ANNABELL. This memorial page is dedicated for family, friends and future generations to celebrate the life of their loved one. CHESNEY, ANNABELL AUDREY of Gladwin. Died January 18, 2019. She was 95. Born May 11, 1923 in Hume Township, Michigan to the late Joseph and Violeta (nee: Leiby) Fahner. She married James Chesney on November 25, 1944 in Highland Park, Michigan. He died March 2, 2015. She is survived by two children, Sharon (the late William) Brown and John (Marlene) Chesney; 11 grandchildren, Kristina (Curt) Munday, William (Jeannine) Brown, Heather (Jason) Bradley, Beth (Mike) VanLoon, James (Alicia) Chesney, Shaun (Kristie) Chesney, Megan Chesney, Richard Chesney, Deborah Wilkinson, Michael Chesney, Mary (Kevin) Emerson; also survived by 13 great grandchildren and 2 great great grandchildren; she was preceded in death by two children, Richard Chesney and Cathy (the late Larkin) Ervin. 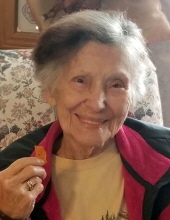 Annabell was a member of Fellowship Church, Gladwin and the VFW Ladies Auxiliary in Beaverton. Funeral service will be 10:00 a.m. Wednesday January 23, 2019 at VILLAGE FUNERAL HOME 135 South St., Ortonville. Pastor Ryan Morrill officiating. Interment will follow at Port Austin Township Cemetery, Port Austin at 3:00 p.m. Wednesday. Family will receive friends on Tuesday from 3:30 to 7:00 p.m. Memorial contributions may be made American Heart Association. Envelopes are available at the funeral home. To send flowers or a remembrance gift to the family of ANNABELL AUDREY CHESNEY, please visit our Tribute Store. "Email Address" would like to share the life celebration of ANNABELL AUDREY CHESNEY. Click on the "link" to go to share a favorite memory or leave a condolence message for the family.